The number 1 sci-fi adventure for the young adults in Russia goes worldwide now. A novel inspired by iconic anime titles likes Neon Genesis Evangelion, Tokyo Ghoul, and Darker than Black. A badass veteran fighter is transferred into the body of a child in the urban Tokyo of a parallel world, an epicenter of clan wars, a dangerous place where you have to watch your step, your back, and what you say. A kid with the experiences, thoughts, and beliefs of an adult mercenary now goes by the name of Shinji. In daylight, he pretends to be an ordinary student in a school, full of heirs of powerful clans and tries to figure out his studies and handle teenage relationships. At night, against the backdrop of a Tokyo teeming with shady goings-on, Shinji is a skillful agent who possesses neither weaknesses nor mercy. He has his mind, strong beliefs, and will to fight for power, money, and respect in this new world. He will show everyone what he is made of and the criminal bosses will know and fear his mask. Still, the powers that be of this world are not willing to share their thrones with anyone and are prepared to spare no expense to get rid of this threat. While the deadly conflict is quickly escalating, Shinji has to carefully hide his personality under a mask, so as not to endanger his daily life, because he is not ready for an open conflict just yet… His road lays through shadows, his steps are silent, his moves are deadly. As you know, rogues do it in the darkness, rogues do it from behind. Changing Masks is the first book of the sci-fi adventure series Whirlwind written by critically acclaimed author Nicholas Metelsky. This series is the ultimate adventure of a lifetime, as the readers get to watch Shinji start from the bottom and work his way to the top. The world Metelsky has created is full of inconceivable and tricky fights, modern magic, mechas, and the sin of human pride. 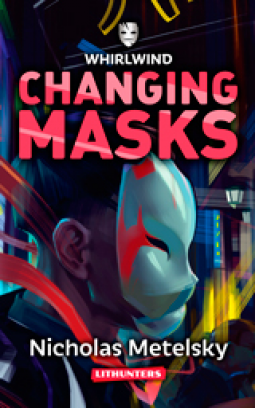 In this explosive mixture of science fiction and animesque setting, our hero has to find and conquer his place… hiding his true self behind a mask.